Martin Gelinas considers his role for the Nashville Predators to be more than that of just another player. At 37, and in his 19th NHL season, Gelinas has served as an on- and off-ice role model to a youthful bunch that has stayed in the playoff chase despite major off-season losses. Gelinas' season ended Feb. 21, when he tore the anterior cruciate ligament in his right knee. He finished with nine goals and 20 points in 57 games, but he was far more important than mere numbers. "He's a guy that you can say, 'This is what a pro hockey player should be like,' " said Barry Trotz, the Predators coach. Gelinas' professionalism has been felt by his coach, teammates and the Nashville community. It's also an effort that has been recognized by the members of the Professional Hockey Writers' Association that cover the Predators on a full-time basis. That group has made Gelinas its choice for nominee for the Bill Masterton Memorial Trophy. The award is given to the player deemed to best exemplify perseverance, sportsmanship and dedication to the game of hockey. "Over the years some great players have been awarded that trophy and obviously for a good reason," said Gelinas. "When you look at what some of the guys have overcome (to win), for me, I don't have cancer or anything like that, but there's something I can lead with, a desire to play and a love of the game and that shows and translates on the ice through my teammates." The Bill Masterton Memorial Trophy is an annual award under the trusteeship of the Professional Hockey Writers' Association and is given to the NHL player who best exemplifies the qualities of perseverance, sportsmanship, and dedication to hockey. The winner is selected in a poll of all chapters of the PHWA at the end of the regular season. The trophy was first presented by the NHL Writers' Association in 1968 to commemorate the late William Masterton, a player for the Minnesota North Stars, who exhibited, to a high degree, the qualities of perseverance, sportsmanship and dedication to hockey. Masterton died on Jan. 15, 1968, after an injury sustained during a hockey game. With the Predators' dependence on younger players like Jordin Tootoo, Vernon Fiddler and Alexander Radulov, a veteran presence like Gelinas isn't just welcomed, it's a necessity. As much of a calming presence on the ice, it's his work with the young players off the ice – nutrition, dress, game preparation, pacing through an 82-game season – that is so vital. "It's what you do daily," said Gelinas. "It's how you get in a routine to get in the weight room, and they see it. (They say), 'It's worked for that guy for 19 years, it might work for me.' Then you go on the ice and slowly after practice, you talk to them, 'Let's try this drill or shoot the puck this way.' They're young and they're eager and they're excited and that's what the game is about." Gelinas does for his younger teammates what was done for him as a youngster in the League. Taken by the Los Angeles Kings with the No.7 overall pick in the 1988 NHL Entry Draft, he was dealt to Edmonton in the Wayne Gretzky trade months later. In his first full season in Edmonton, he was part of the "Kid Line," with Adam Graves and Joe Murphy that led the Oilers to their fifth Stanley Cup, in 1990. Gelinas was just 20 years old when he carried the Cup, and he learned a lot from the veterans he played with in those early years. "You look at the dressing room we had, they were leaders and you followed," Gelinas said. "But there was one guy in particular, and it was Craig MacTavish. He was sitting beside me in the locker room. The way he came to the rink every day, smile on his face, great attitude. Maybe he wasn't the most talented, but you knew what you were getting every night. "I was fortunate at a young age (to play) with players who would do that, like MacTavish, Kevin Lowe, (Mark) Messier, Jari Kurri, Craig Simpson. I learned a lot from those guys. This is my way to give back to my teammates." Gelinas also gives back to the Nashville community. This season, he and Fiddler and their wives hosted a holiday party at the Sommet Center for 90 women and children from the Youth Encouragement Services and Morning Star Sanctuary. It's not the first time Gelinas has made himself a part of the community in which he's played. "As soon as I started playing and felt like I could make a difference in someone's life, I realized I should be out there and trying to make an impact and help people and try to relate to people that are in different situations," he said. "If it's Big Brothers or Special Olympics, you go there and spend a little bit of time, and it feels good. Once I realized I can make an impact and make a difference, I wanted to be out there." He also wants to be out on the ice again. 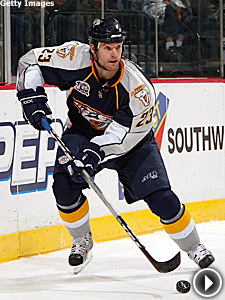 While surgery to repair his knee has ended his season, he says he plans on playing a 20th season in 2008-09; even though the one-year contract he signed with Nashville last July expires at the end of the season. "You take it a year at a time, and, obviously, I've had some setbacks this year; but that's one more challenge, one more thing that I have to prove to myself, that I'm capable of playing in this League and coming back from this knee injury," he said. "I know what I can do and chip in for a team and keep going." In the meantime, he's doing his rehab in Nashville and remains a presence around the team -- still motivating, educating and helping when he can. "When I'm done, hopefully there'll be some players still playing and they'll say Martin Gelinas was a good help," he said. "That's all I can ask for."